Pricing: All prices include up to a 4-Color print, but exclude a set-up fee. All prices are subject to change without notice. To ensure you have the best possible price, contact your Sales Counselor for an aggressive BottomLine™ quote. Standard Production Time: Production begins the business day following receipt of PO and approved, output-ready art. Art that is not output-ready requires additional lead time. Standard lead times are based on orders up to 5,000 pieces. For larger quantities, call for availability. Custom dies require 3 additional work days. Packaging requires additional production time determined by the type of packaging required. 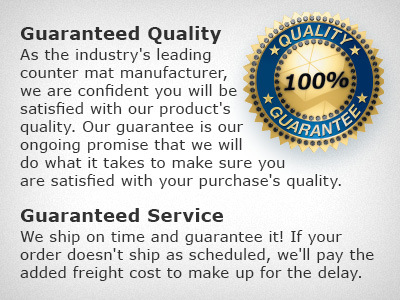 Order with Production Proof: Lead time following proof approval is 5 days. Rush options are available. Rush Services: Contact us for order verification. All order details, including PO, output-ready art, shipping instructions, and payment arrangements must be received by Noon Pacific Standard Time (3pm EST). Art must conform to our Art Check List. See product options for rush service availability. FREE PDF "Paper" Proof sent for reference ONLY. Add one day or $50/v for PDF approval if required. Quantities over 2500 may incur additional charges. See Lead Time / Rush Options for more details. Rush charges cover any special handling, overtime and other factors necessary to meet a rush schedule. Order changes made after an order is submitted will affect delivery dates and rush charges may be incurred to maintain scheduled ship date. Additional rush charges, when required, are $50/v (minimum) per day rushed. FREE PDF "Paper" Proof: A digital "Paper" proof in standard PDF format is emailed for every job. Production Proof: $100/v. MousePaper® Calendar is $125/v for 12 pages and $62.50/v for each additional 6 pages. Production proofs are recommended whenever color matching is critical. A production proof is usually required on larger orders. Terms: Standard credit terms are Net 30 upon approved credit. A signed credit application is required. Terms for credit card payments are Net 10. Late payments will incur a 1½% per month late fee. Prepayment of initial order may be required. Marketing: It is our practice to use overruns for samples and product images in our advertising. If this is not acceptable, please indicate this to us in writing. Co-Op Programs: Co-op programs are happily considered. Contact your Sales Counselor with details and DIGISPEC® will develop a program for you. Cancelled Orders: If an order is cancelled, you are responsible for all charges incurred up to the point of cancellation. Returns: Authorization is required prior to return of product. Unauthorized returns will not be accepted. No credit will be issued for product that cannot be returned. Box Weights: Box weights may vary depending on the actual raw materials used. Some variation is normal. Custom Dies: Die/handling charge is usually $150/v, but may be more depending on the size and complexity of the pattern. A custom die will increase lead time by three days. Multiple Destination Charge: DIGISPEC® will ship to separate locations for $12.50/v per location. If specific instructions are received within three days of shipping, a $18.75/v charge per destination will be applied. Non-standard case-packs will incur additional charges. Packaging: Standard DIGISPEC® packaging is in bulk. Special polybagging (sealed or unsealed) with a standard 2 mil. polybag is $.188/v per piece. To include a supplied insert or label, please add $.125/v. DIGISPEC® will quote most types of standard packaging including shrink wrap and custom retail packaging. Packaging increases required lead time. Non-standard case-packs will incur additional charges. Below Minimum Charge: Minimum order is 100 pieces unless otherwise noted. If an order is submitted for less than the minimum quantity, a below minimum charge of $125/v is applied. Quantities below 125 are not available for MousePaper® Calendar products. Shortages & Overages: All orders are subject to 5% over or under run. Exact quantities incur a 10% surcharge. Job Changes: Job change orders that occur once a project is in our system may incur additional or duplicate charges as applicable. Changes may also affect scheduled delivery dates. To avoid additional charges or delays, nail down all loose ends prior to job submission. Shipping: F.O.B. Nevada. In accordance with the shipping terms of F.O.B., the responsibility of an order transfers to the customer when the order is shipped. Claims for shipping damage MUST be made by the customer when the shipment arrives. DIGISPEC® accepts no responsibility or liability for carrier-caused delivery delays, problems, or product damages.